Oscar Workbag £69, Mischa Barton Handbags; Patent satchel £76, Kew; Grey stud front slouch bag £25, Dorothy Perkins; Arconate tote £40, Aldo; Terisa clutch bag £35, Fiorelli. 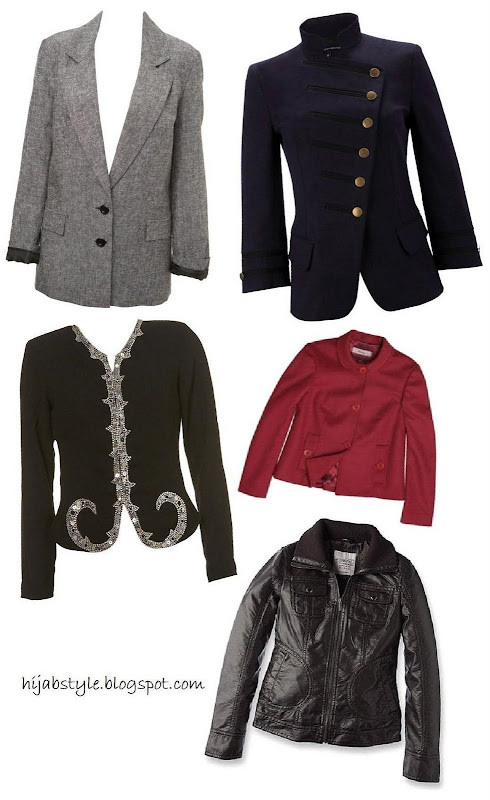 Grey Chambray Blazer £45, Miss Selfridge; Tempest Jacket £115, French Connection; Jewelled Jacket £120, Topshop; Wool Pleat Jacket £129, Kew; biker jacket £69, Esprit. 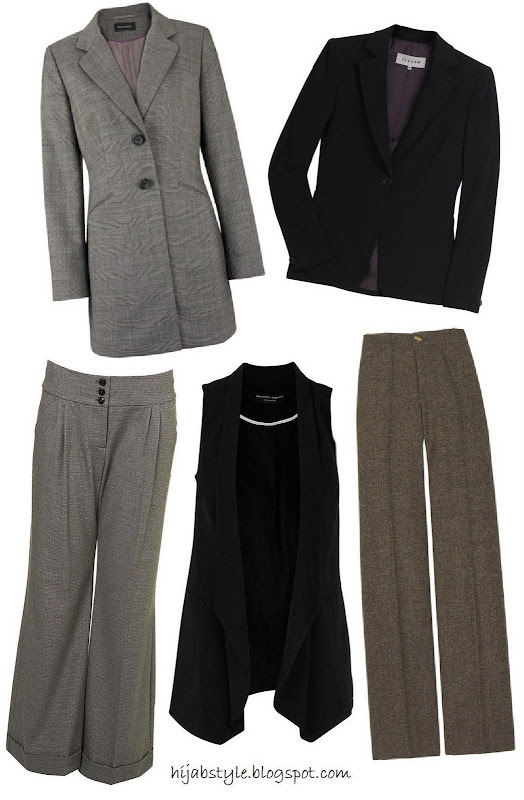 Long subtle check jacket £169, Planet; Fine wool Highgate jacket £189, Jigsaw; Black waterfall waistcoat £30, Dorothy Perkins; Puppytooth wide leg trouser £35, Topshop; Tweed wide-leg trousers £250, Marc by Marc Jacobs. Asalaam alaikum, Jana you have done good! Lol. I particularly like the Tempest "military" jacket as well as knitted dresses - but I thought both were maybe too form-fitting to be considered okay hijab-wise... I'm not against good fit, especially if you have curves your clothes need a bit more shape... but what do you guys think? That pink bag is CUTE masha'Allah! 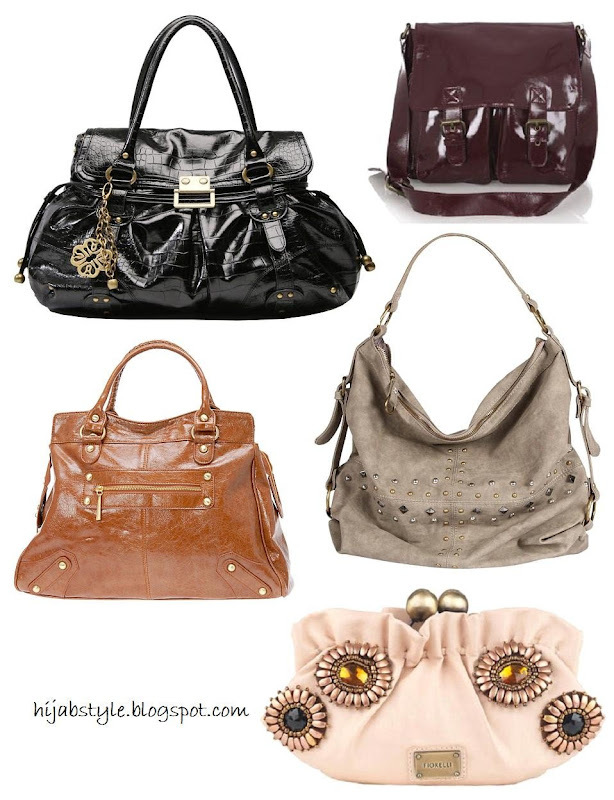 Please be careful when purchasing leather and suede handbags as a lot of purses made in China and some other countries are using pigskin as it is much cheaper and readily available. Jana, can you please do a post or a few on environmentally conscious fashion - purchasing fair-trade, cloth purses (Indian cloth bags can be very cute paired with a maxi skirt), recycling clothing and using natural material when possible? I'm agreeing with you Leila, the more curvy you are the more the need for jackets which give your body some structure but you've got to be careful that their not too fitted. Its difficult to strike a balance sometimes!